Most of us have some lighting outside our home that belongs to us, and that we control. Porch lights or security lights, for example. A lot of people also like to add outdoor lighting as part of decorating for the holidays -- some at Halloween and even more at Christmas. We all like to be safe too, and to keep our house, our family, our pets, and our guests safe too -- even if they're only staying long enough to pick up some candy or sing a carol. That means that we want the lights, power cords, controls and everything else associated with our outdoor lighting to be done with safety in mind. There's one thing that isn't true about lighting, and electrical connections in general, but that many people believe, is that a temporary setup can be done without much regard for whether it's really safe, or "up to code," or not. That's not so. 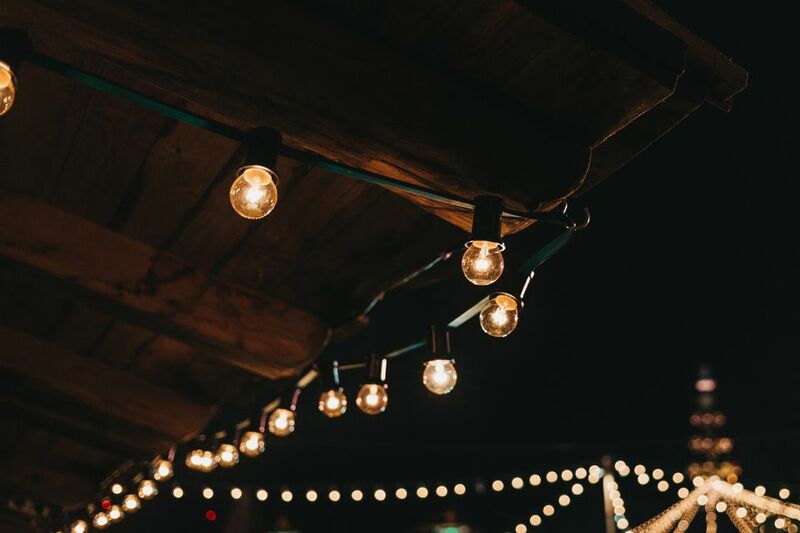 Because they're not permanent installations, temporary lighting and power connections can be more dangerous. The National Electrical Code includes special requirements for temporary installations that apply in addition to all of the regular guidelines. So the top tip of all is to make it safe. Follow the tips here, of course, but keep in mind that safety is goal #1. Then make it look and function the way you want it to. If you're installing a lighting fixture outdoors, it must be designed and built to be there. For two quick examples, a light that's under your porch roof and never gets wet needs to be rated for damp locations, or say "outdoor" on it, because it will still get damp, cold and hot, and it needs to be able to take that. A wall fixture that goes next to your door but doesn't have a roof over it needs a higher rating -- weatherproof, weather resistant, and "suitable for wet locations" are the words you're looking for. In an exposed fixture such as an outdoor flood light, most of us think of this. But it'll pay you in terms of the life of the bulb and the ease of replacing it to do the same with your porch light. If you're having trouble finding a standard bulb that's rated for outdoor use, check the fine print on some appliance bulbs. If it can survive in a freezer or an oven, it can probably survive outdoors. Most fixtures, indoor or outdoor, will have a sticker or label that says "Maximum Wattage: 60W", or 75W or 100W. Whatever it says, respect that. It's there to keep you from putting in a light bulb that will overheat the wiring in the fixture, which will damage the insulation on the wires. What matters most is the actual wattage of the bulb -- not the "incandescent equivalent." If you're putting a CFL bulb in a fixture with a 60W rating, for example, you can use one that draws any amount of power up to 60W (which would put out more light than a 200W incandescent bulb). The extension cords used indoors are made for that. They're usually light and flexible, so they're easy to keep out of the way. And they're definitely not made to stand up to getting wet. Buy and use only outdoor-rated extension cords for any temporary lighting you're connecting outside your house. If you want to hang some lighted pumpkins or skulls or candy canes or icicles on your eaves or porch railing, only use ones that are made to go there. The labeling should say "indoor" or "indoor/outdoor" or "outdoor." Keep the ones that say "indoor" inside. Either of the other two is built to take outside. Be careful to keep lighting materials that generate heat, like many light bulbs, away from other materials that can ignite and burn easily. An accent light under a manger to give it a glow may be just the effect you're looking for in your nativity scene, for example. But if you've also scattered a lot of hay, or straw, around the stable, the effect you get might be a little bit different. You should always plug temporary outdoor loads into outdoor receptacles, rather than running a cord out through a doorway or window from one of the receptacles inside your house, and those receptacles need to be weather-resistant. Even though they'll have special outdoor covers over them, the receptacles themselves need to be able to take dampness, freezing, and heat without being damaged. They need to be rated as weather-resistant. GFCI, or Ground Fault Circuit Interrupter, protection is one of the most important electrical safety improvements of the last forty years. GFCI outlets should be installed in kitchens, bathrooms, garages, and even attics, crawl spaces, and unfinished basements. It's required anywhere you might be plugging something in while you're grounded. And that certainly includes when you're standing out in the yard. If the wiring that feeds your outdoor receptacle has GFCI protection from a circuit breaker or some other GFCI device upstream, you can install a standard weather-resistant receptacle in the outside box. But if it doesn't, then you need to install a GFCI receptacle there. Weather-resistant, of course. If you have an outdoor receptacle that's on your porch or your screened-in patio or in some other location that's protected from direct protection, then you can cover it with a "trap door" cover that will close, and keep it protected, when nothing is plugged into it -- and it's OK, then, to plug something into that receptacle and leave it there for a few days. These covers will be marked "Suitable For Damp Locations." If your outdoor receptacle isn't under a roof or some other protective cover it needs to have a special cover, known as an "in-use" cover, over it. As the name implies, these covers will keep the receptacle​ and the plug that's in it, dry -- even in the rain. Be careful when you're attaching temporary lighting strings and ornaments. Don't use something that might damage the wires, and avoid anything with metal in it. Metal conducts electricity. Plastic cable ties are one popular and inexpensive choice for this task.